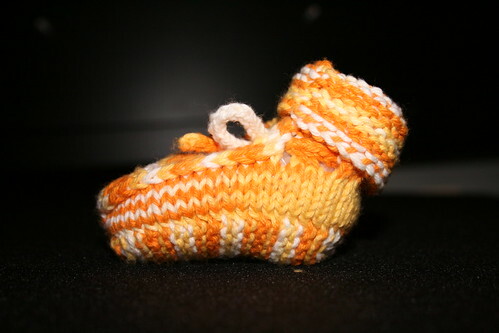 There has been knitting though. I finished my Laminaria and blocked it on the guest bed (it was too large for the blocking board that I received as a birthday present). Blocking it was really scary as I was afraid that I would put my hand through it or break the yarn somehow. To be honest, I could have stretched it out more than I did, but I will know for next time. I am so pleased with it. I can hardly believe that I made it. 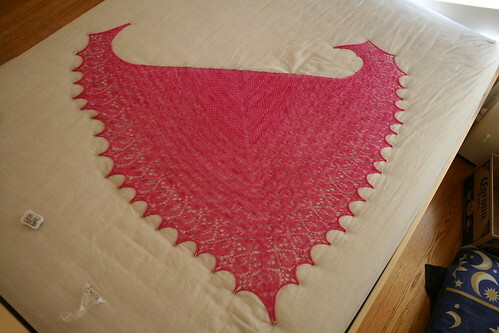 As soon as it was blocked, I started a scarf from Nancy Bush’s Knitted Lace of Estonia. I have no pictures yet, but it is lovely. I am doing nupps for the first time which has been fun. I can understand why some people don’t like them, though. Apparently I am quite a tight knitter (I have to go up at least a couple of needle sizes if I want to get gauge) so nupps are quite a challenge for me. 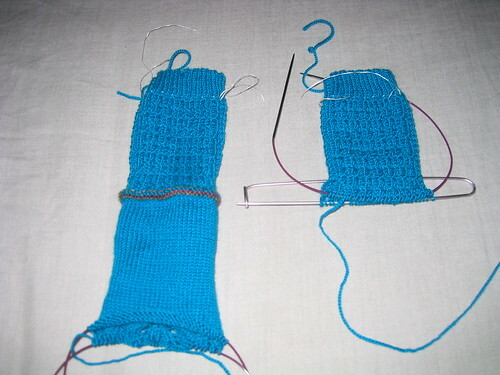 I have to completely let go of the yarn to have any hope of catching all of the stitches on the way back (nupps are knitting into the same stitch and then doing a yarn over many times – it turns one stitch into many. On the next row those stitches are all purled together, which means getting the needle into five or seven stitches depending on the size of the nupp). I also cast on for this season’s “must have” accessory – the Silk Garden Striped Scarf by Jared Flood. 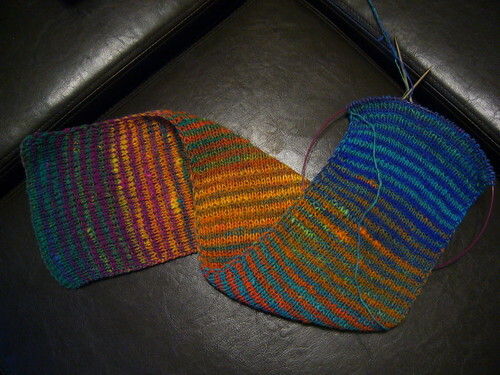 Although I am using Kureyon Sock yarn in the rainbow colourway. I originally bought the yarn to make a shawl of some kind (I love the long colour changes), but when I got the yarn home, I realised that my dad might really like to have something made from it (I made him a scarf last year that was a complete disaster. It is my one failure so far!). This is a photo of the first go at it. I cast on 55 stitches and worked the scarf from there. 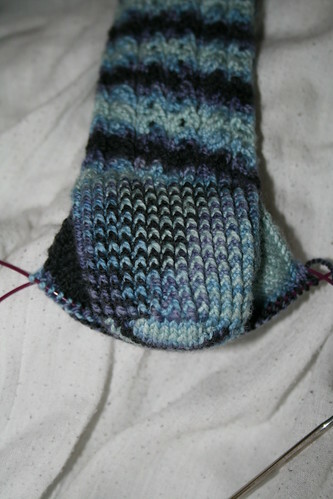 Unfortunately I made a complete mess of the slipped stitch edging (see my comment about knitting tightly above!) that I didn’t thing would be corrected in blocking. I also wanted to keep open the option of slightly felting the scarf, and I felt that it was slightly too narrow to do that. 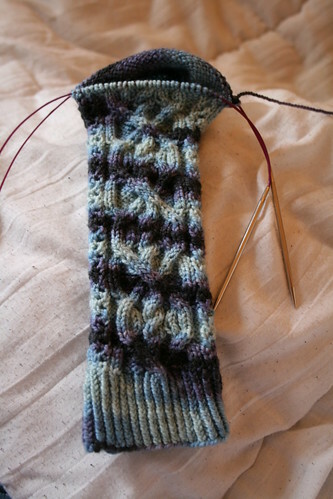 I frogged the lot and started again with a cast on of 70 stitches. 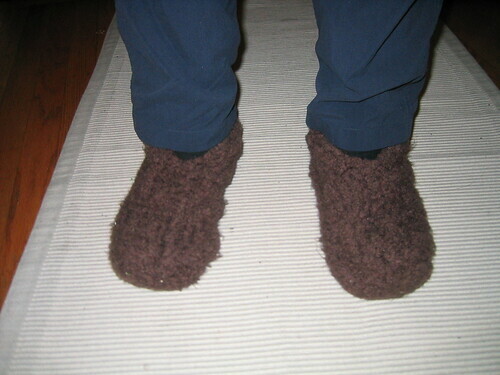 I made a concerted effort to keep the edges loose, but I am still unhappy about how it looks. 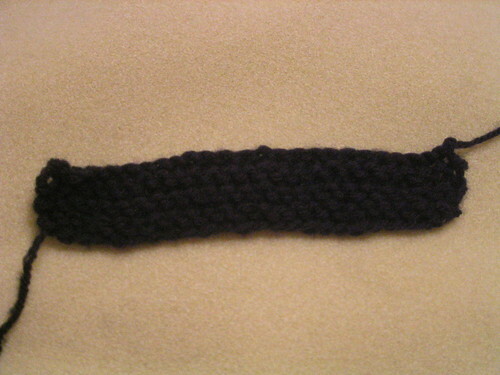 The edge where the yarn is carried up the side looks sloppy to me, and I may frog it again. 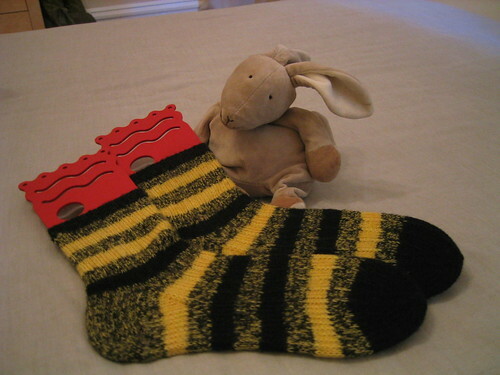 However, the post man has just turned up with my knitpicks order. My grandma wanted to buy the kiddo a warm jumper, so I asked her if she would like to buy the yarn and I would make him one. Both the pattern (ravelry link) and the yarn (the dusk colourway) have now arrived, so everything else is on hold until this is finished. I need to complete this before my parents leave so that they can take pictures back to my grandparents of him wearing it. Wish me luck! There may be a lack of knitting content for a while due to my enabler husband persuading me to play Final Fantasy Tactics A2. There was some hope for my knitting when I discovered that the shoulder buttons on my DSlite are completely broken (meaning I couldn’t select players to go into battle), but as we are a two DS household I am able to use the trusty old DS chunky that I gave to Yoz when he bought me the small shiny black box of heaven. 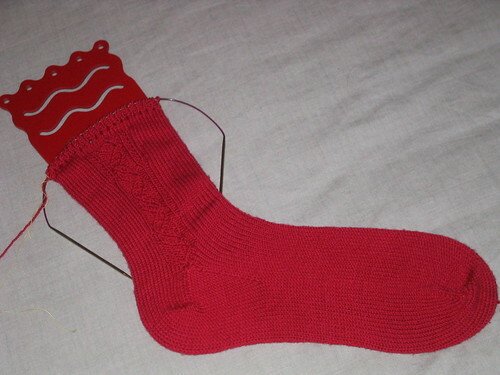 There *has* been some knitting – I finished the biological clocks, I am putting in the afterthought heels of the round 4 Sock Madness socks and I have made a start on the round 5 ones (a lovely, easy stitch pattern that makes them a fast knit). I got over the last hiccup on the Laminaria but have now made another mistake that needs tinking back to fix. I ended up with the wrong stitch count after knitting whilst watching TV. Serves me right, really. Unsurprisingly (for anyone who has met me) I bought a black and a red ball. 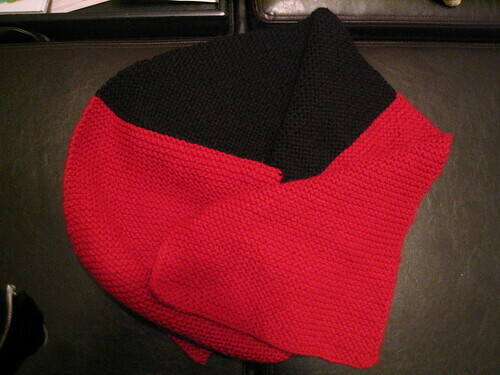 I had a vague idea that one started by making scarves, which is what I planned to do. As I neared the end of the first ball, I had to go back to the shop to find out how to join the second one to it, and they were really helpful and supportive. I ended up buying another ball to add on to the other end as I cast on for a rather wide scarf without realising it! I am quite proud of my first project, even though one end is quite a bit wider than the other (you can’t see it in this photo though). 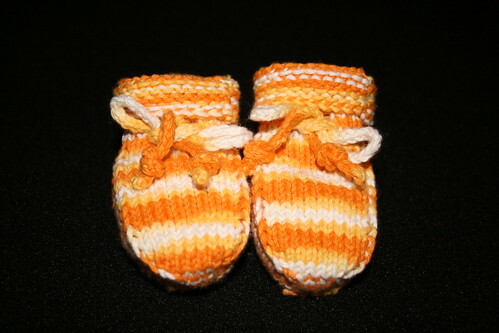 And now I am desperately addicted to knitting. I am actually quite amazed at myself for it. I didn’t think it would be my thing. I have never been particularly crafty or arty in my own time, so this has taken me by surprise. I always thought of knitting, sewing and crafting in general as not being as valuable as scientific endeavour. These were not going to broaden my mind like studying and reading would. I did spend quite a while doing origami and knotwork, justifying them to myself as being more mathematical crafts. But now I am able to create for the joy of creating. For the enjoyment of the process. 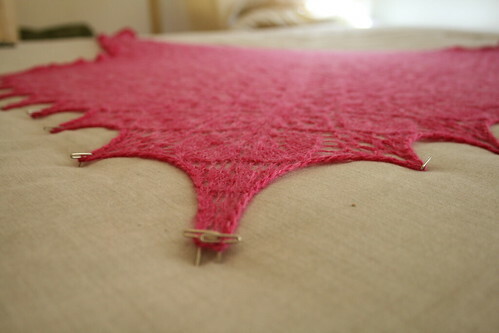 (Yeah, the more I think about it, the more I am convinced that I am a process knitter). For the satisfaction of a finished object. And I can’t get enough! At the end of the month I will be 30. It has been a long time since the last milestone birthday and as my dad would say, a lot of water has been passed since then. It has been quite an extraordinary time; the worst depression of my life, meeting the person I want to spend the rest of my life with and getting married, having a child, making a home (and a life) over 5000 miles away from London. I have grown into an adult that I think my younger self would have been proud of. And part of that has been the ability to get rid of a whole load of preconceived constructs about the world. I worry that learning to sew will cut into my knitting time. And I worry that I won’t enjoy knitting as much when there is a fancy sewing machine sitting there waiting to be used. But I see myself now doing all the things that I was doing with knitting a year ago – checking out the price of materials, trying to work out what I will need in the way of supplies, eyeing up books to learn from and places in the city to get help. 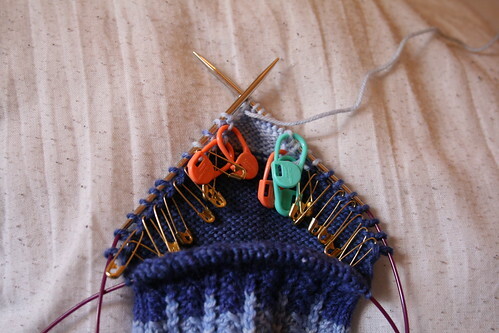 I have finally thrown off my prejudice against sewing (and knitting) and am itching to get started. I may not enjoy it as much as knitting, or at all even, but I will be able to hem my own trousers and make my own bed linen if I choose. And I think I probably will. 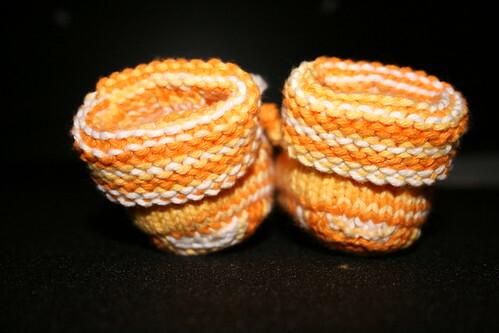 Hopefully I will be able to turn the knitting obsession into a crafting and creating obsession. Be it quilts, knitted items or homemade clothes. Here’s to being on the cusp of thirty and finding the motivation to act on my desires. Nothing to report as Yoz has been in hospital since Wednesday. Latest thoughts are that he has salmonella, but they need to do more tests to be sure. Hopefully normal programming will resume shortly.